Added by Indo American News on December 5, 2013. Dr. Randhir P. Sinha, a neurosurgeon of Clear Lake was interviewed by Anjaly Thakkar, a Berkeley educated teacher at the Kinkaid School. 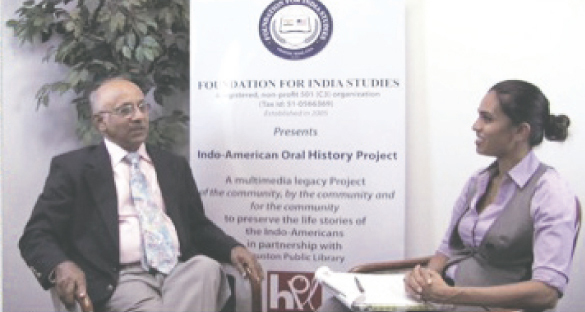 HOUSTON: Dr. Randhir P. Sinha, a prominent Indian Neurosurgeon from the Clear Lake area was interviewed for the Indo-American Oral History Project by Foundation for Indian Studies (FIS). Dr. Sinha has been a Resident of Clear Lake since 1975 and became a prominent member of the Indian American community in Houston. He was one of the founding members of the Indo-American Chamber of Commerce of Greater Houston during Consul General, Wangdi’s time and later became its President in 2004-2005. “Until the formation of the Chamber of Commerce, it was difficult for Indians to even get an appointment with a CEO of a major corporation in town” he said. Dr. Sinha was also a founding member of the Indo-American Political Action Committee. He entertained several Congressmen at his home and tried to promote friendship between America and India. He takes pride in his attempts to influence the public policy of America towards India, particularly in the successfully concluded Nuclear agreement under Bush administration. Dr. Sinha, describes himself as socially liberal and fiscally conservative. He does not approve America’s current fiscal deficit which runs into several trillions of dollars. He questions: how can anyone spend more than their income? Even though he is a staunch Republican, he has friends on both sides of the aisle. He was a fundraiser for both Democrats and Republicans. He fondly remembers his friendship with former Congressman, Nik Lampson, a Democrat and the late Bob Perry, owner of Perry Homes, a die-hard Republican and a great fund raiser for Republican party. Being members of the South Shore Harbour Country Club, both Dr. Sinha and his wife Meena have many astronaut friends in the Clear Lake area. They both are avid tennis players and routinely interact with main stream Americans. Having retired after 37 years of medical practice, Dr. Sinha has now more time to play golf and Bridge, in addition to spending quality time with his son Samir and daughter Anjaly and his grandchildren Lakshmi, Vaishal, Sahasra, Revati, and Anisa. Dr. Sinha and his wife Meena support many community organizations like Pratham and Meenakshi Temple etc. Dr. Sinha’s daughter, Anjaly Thakkar learnt both ballet and Bharat Natyam and later co-founded the “Urban India Beat” an Indo-American fusion dance company. Dr. Sinha and wife, Meena had not experienced any sort of discrimination in all these years in America. Asked for his advice to next generation Indians, his message is to get a good education and get involved in main stream politics. Dr.Sinha’s video interview will be digitized and permanently archived along with its transcription in the Indo-American Oral History collection of the Houston Public Library. The Indo-American Oral History project, a Legacy Project for Houston’s Indo-American community is an undertaking of the Foundation for India Studies.